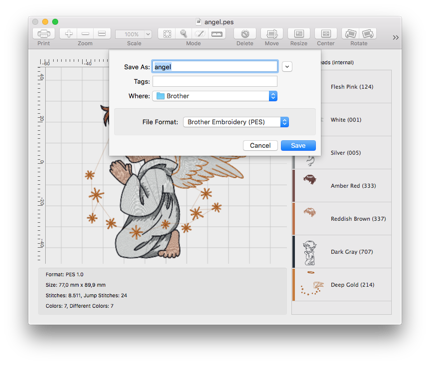 I just released StitchBuddy for Mac v2.10.4 as a minor bugfix release: As mentioned the "Save as…" dialog preselected the wrong file type when saving a design, which often resulted in a converted file (if the user confirmed the wrong selection). This issue is fixed. In addition I improved the recognition of writable file types, which sometimes prevents saving a design using the "Save" command although StitchBuddy could write the corresponding file type. Registered users can download the new release for free. Edit: Please download again if you're facing problems with lost preferences / license codes in this version! I've provided an emergency fix. Some users reported that StitchBuddy would save PES files in the JEF file format, and I was surprised by this problem as there is no function in StitchBuddy to auto-convert any file formats. I found out that until StitchBuddy v2.9.1 the „Save as...“ dialog preselected the current file extension (e.g. PES) when prompting for a new file name, while since StitchBuddy v2.9.3 its default is the first file format of the list, which is JEF. This happens without any related code changes in StitchBuddy, so it seems Apple has changed some of their libraries in the meantime, and I wasn’t aware of this behavior. So StitchBuddy doesn't convert PES to JEF on its own, but preselects an incorrect file type in the "Save as..." dialog and - after the user's confirmation - converts the file. Quite inconvenient and I will work on it! Until a solution you need to change the file type manually when using the „Save as…“ option. Edit: Apple, that's not funny: After I rebuilt StitchBuddy with the current version of Apple's developer environment (Xcode), the problem disappeared ... so it seems they found and fixed it in the meantime. Good that I can provide you a fix within the next days, but bad as I wonder what they might have broken, now. I will perform some more tests before uploading a new StitchBuddy version for OS X. For those of you who are waiting excitedly for Apple's release of OS X 10.11 aka "El Capitan" today: The current version of StitchBuddy for Mac is compatible with the new OS, including its plugins. More details can be found in the version history on StitchBuddy's website (OS X, iOS). StitchBuddy v2.10.3 is a free update for all registered users, and can be either downloaded from the corresponding Download page (OS X), or (after Apple's approval in a few days) updated in Apple's App Store (iOS). Please leave a comment at Facebook, a rating / review in the App Store, and spread your opinion about StitchBuddy by word of mouth. Have a wonderful July, 4th! I just had conversations with users, that were unable to modify designs with the corresponding toolbar buttons grayed-out. This is no limitation of the trial version, which is full-functional, but just a step they missed when modifying designs. For customizable background colors in StitchBuddy HD / View I had to create a tool to select a color: While on OS X default color pickers are available, iOS doesn't provide such a control out of the box. 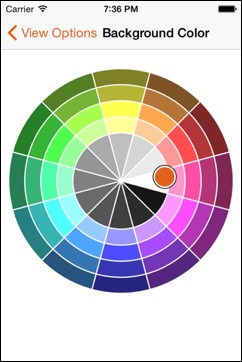 I decided to go with a color wheel, which in my opinion is the right way to pick from multiple colors without loosing usability. There is still some work to do before StitchBuddy's next versions on iOS will allow you to select a background color and an option to print it as well, but this feature will definitely come. Since yesterday StitchBuddy View v2.9.3 is available in Apple's App Store, and can be downloaded / updated for free on your iPhone or iPad. This version incorporates a canvas size based on the opened design, and the corrected VP3 import. The approval of StitchBuddy HD is still pending, but I expect it the next days including the mentioned changes and a basting function using not locking but overlaying stitches. 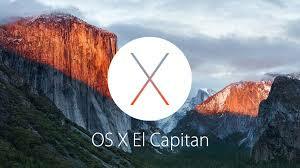 The Mac version has just been released, too, and can be updated for free by registered users. Have fun with this update, and if you like StitchBuddy I'd appreciate a rating or even a review in the iOS App Store. Update: It took Apple nearly a week to approve StitchBuddy HD, but finally it's available since January 13th, 2015.